Any baker, chemist, or carpenter will tell you accurate measurement is everything. I've ruined enough cupcakes to vouch for that. If you're a crafty, DIYing genius - which of course, you are - being able to read a ruler or tape measure comes in handy. There was a time when you might have heard words come out of my mouth like "9 and a half inches plus two little line thingies" or "it's that tiny line right before the 4-inch mark." Embarrassing. I know. When I finally broke down and forced myself to learn how to read all the "little line thingies," life became so much easier. Not only did I make fewer mistakes on my projects (which saved time and frustration), production was a faster because I didn't have to stop and count lines. If you already understand how the fractions of an inch work, then it's time for you to do the hard thing and just start using them. Practical Advice: Grab a ruler and start measuring everything for a couple of days, forcing yourself to use the correct terms. Measure the space between lines on your notebook, the length of your kid's fingers, the length of one of your dog's hairs, or the width between the keys on your keyboard. Just develop the skill. Until it becomes habit to read the ruler correctly. Really. Now. Go forth and findeth thee a ruler. (This is one of my faves because the inch starts and the very end instead of a notch in like most rulers.) Get crackin'! If it's been too long and you don't really remember how the fractions of an inch work, here's a little refresher. Think of an inch as a race. you have a starting line and the finish line. The starting line is the beginning of the race before you've gone any distance. That line doesn't count as any measurement because no distance has been covered. If you take the length of the race and divided into two pieces then you have two halves. You've covered the first half when you reach the half-inch (1/2") mark and have completed the full inch when you reach the 1-inch mark. 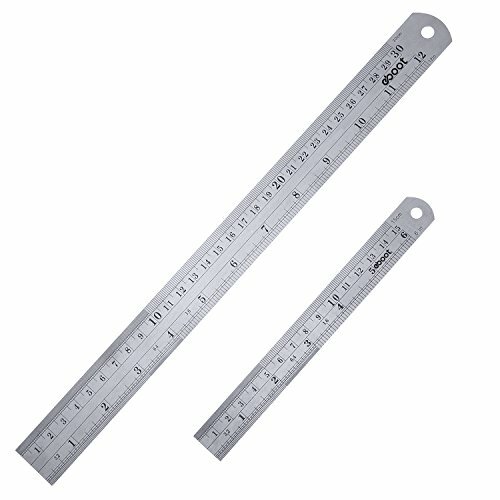 On most rulers and tape measures, the inch marks are the longest line and the half-inch marks are slightly shorter. Once you understand the half-inch, you're on a roll. The next fraction of an inch you need to learn is the quarter-inch or 1/4". A quarter-inch is what you get when the inch is divided into 4 equal pieces. The quarter inch marks are in middle of each half-inch section. When you leave the starting line and get halfway to the half-inch, you're at the 1/4 inch mark. Notice that the 2/4" mark falls on the same line as the 1/2" and we always refer to that as a half-inch. So when reading quarter inches you'll only ever say "a quarter," also said "one-fourth." Or "three-quarters," also said "three-fourths." Quarter-inch lines are usually a little shorter than the half-inch lines. Now that you've got the 1/4" down pat, let's look at the eighth-inch marks. Eighth-inch marks are in the middle of each quarter-inch segment and their lines are usually a little shorter. The full inch is divided into eight equal sections. You'll see that again, some of the eighth-inch (1/8") marks fall on the same lines as quarter-inch or half-inch marks. We always refer to those lines as quarter- or half-inches. For example, instead of saying "six-eighths of an inch," you say "three-fourths of an inch" or "three-quarters of an inch." Then, there are sixteenths of an inch. The inch is divided into sixteen equal sections. The sixteenth is the shortest line and smallest space you'll see on most rulers, although some go down to thirty-seconds of an inch or even sixty-fourths. Again, if a sixteenth falls on a line that is already named for a bigger section, you'll use that name. Instead of saying "ten-sixteenths," you say "five-eighths." Once you have a clear understanding of what all the marks mean, feel free to jump back up to the top and follow the practical advice. Practice. Until it sticks.